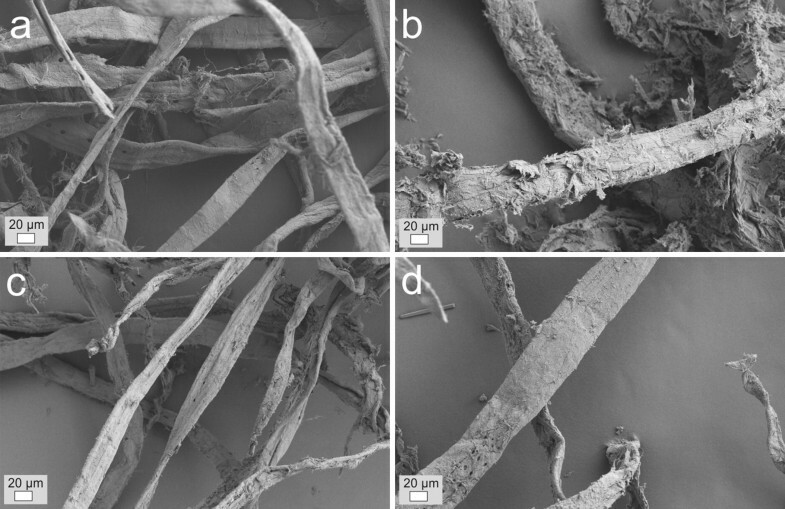 Enzymatic modification of bleached softwood kraft fibres for improved fibre reactivity was studied at high (20% w/w) and low (1% w/w) dry matter content. The role of enzyme family and structure in fibre modification was assessed using endoglucanases from three structurally different glycoside hydrolase (GH) families (5, 7 and 45) with and without a carbohydrate binding module (CBM). Based on the amount of dissolved sugars, enzyme action at high consistency was about sixfold higher compared to a fibre treatment at low consistency. The GH45 endoglucanase was found to be most specific in acting on pulp cellulose whereas the family 5 and 7 endoglucanases had activity also on pulp hemicelluloses. The GH45 endoglucanase was found to be most efficient in reducing molecular weight and viscosity of the pulp. In addition, treatment with the GH45 endoglucanase resulted in the highest micropore volume in fibres and thus an increase in cellulose accessibility. The increased accessibility could be seen as decreased dissolution time in cupriethylenediamine using recently developed analytical techniques: viscometric analysis and microscopic video analysis. At high consistency, CBM was not promoting enzyme action, although CBMs are known to be beneficial at low dry matter conditions. The online version of this article ( https://doi.org/10.1007/s10570-019-02424-x) contains supplementary material, which is available to authorized users. The global demand for renewable, sustainable and biodegradable materials with high performance e.g. in packaging and textiles is increasing. Cellulose is the most abundant renewable biomass resource on the Earth and thus its broader use in material applications is appealing. Currently new feasible applications for paper grade fibres in the areas such as textiles and cellulose derivatives are searched for. 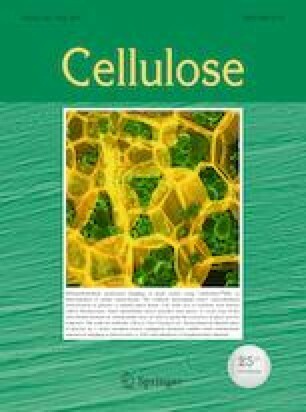 The use of cellulose in these application areas typically require dissolution or chemical derivatisation and numerous novel solvents and technologies are being developed for environmentally sustainable “green” production of cellulose-based materials (Wang et al. 2016). Good fibre reactivity, meaning good cellulose accessibility to dissolving and derivatizing chemicals is a prerequisite for environmentally benign processes that avoid excess use of chemicals (Li et al. 2018a). Mechanical (Zhou et al. 2018), chemical (Wang et al. 2018) and enzymatic (Rahkamo et al. 1998) pulp pre-treatments and their combinations (Grönqvist et al. 2015) have shown to improve fibre reactivity and cellulose accessibility. Fibre reactivity is affected by factors at several structural levels: at fibre, at microfibril and at molecular level (Li et al. 2018a). At molecular level cellulose crystallinity and cellulose allomorphs, degree of polymerisation and the presence of other cell wall polymers have been associated with fibre reactivity. At microfibril and cell wall structural level the microfibril angels and orientations as well as porosity are thought to have an effect on reactivity (Li et al. 2018a). Several studies have demonstrated the use of commercial endoglucanases as a tool for controlled reduction of pulp viscosity and improvement of fibre reactivity e.g. for the viscose process (Engström et al. 2006; Gehmayr and Sixta 2011; Gehmayr et al. 2011; Duan et al. 2016). The benefit of using enzymes instead of acids is that enzymes result in a more porous structure of the fibre wall (Pönni et al. 2013; Grönqvist et al. 2014) which is beneficial for fibre reactivity during dissolution and chemical modification. Enzymatic modification of cellulosic wood pulps to increase fibre reactivity has been mostly studied at low consistency. Two independent studies published in 2015 show that enzyme treatment at high pulp consistency enhances the action of enzymes (Grönqvist et al. 2015; Wang et al. 2015). It has been shown that at high consistency the cellulose enzymes adsorb more to the cellulosic substrate compared to low consistency conditions (Várnai et al. 2013; Wang et al. 2015), which likely favours the formation of enzyme–substrate complex and catalysis. Pulp processing at high consistency is also of interest for the industry due to the possible economic benefits related to lower capital and operating costs (Modenbach and Nokes 2013). Endoglucanase-type (EC 3.2.1.4) cellulase enzymes are most commonly used to improve fibre reactivity. Endoglucanases act on cellulose chains and cleave the β-1,4-linkages between the anhydroglucose units. Moreover, some endoglucanases may also have side-activities towards other polysaccharides in pulp fibres. Thus the enzymes may be capable to cleave hemicelluloses, such as mannans or xylans (Vlasenko et al. 2010). Endoglucanases introduce internal and random cleavages to the carbohydrate polymers and typically reduce the degree of polymerization of cellulose efficiently. Endoglucanases are suggested to act preferentially on non-crystalline areas of cellulose since the enzymes typically exhibit low activity on highly crystalline substrates (such as microcrystalline cellulose) compared to more amorphous cellulosic substrates (Suurnäkki et al. 2000). According to the Carbohydrate Active Enzymes database (CaZy) (www.cazy.org) enzymes with an endoglucanase activity have been assigned to 14 different structural families (Lombard et al. 2014). Endoglucanases from different families differ in size and they possess a unique tertiary structure, which results in differences in their mode of action on cellulose and fibres. Limited number of studies have been addressing the applicability endoglucanase from different structural families in improvement of fibre reactivity. There are only few examples of such studies (Pere et al. 1995; Rahkamo et al. 1996; Suurnäkki et al. 2000; Ibarra et al. 2010) and in these studies the enzymatic fibre treatments have been done at low consistency. The carbohydrate binding modules (CBMs) in cellulases are functional domains, which bind specifically to cellulose surfaces. CBM is an intrinsic part of some fungal endoglucanases, but many enzymes comprise only of a catalytic domain (core). Protein engineering can be used to add a CBM domain to enzymes lacking one (Szijártó et al. 2008). CBMs form specific interactions with cellulose and they direct the enzymes on cellulosic surfaces and thus enhance their action. In total hydrolysis of cellulose CBMs have shown to improve enzyme action at low consistency. The beneficial effect of a CBM has been found to diminish at high dry matter content (20%) (Várnai et al. 2013). Similarly, in fibre modification, a CBM has been found to enhance cellulase action at low consistency (3–5%) (Suurnäkki et al. 2000; Ibarra et al. 2010), whereas at high consistency the effect of a CBM has not been reported. The aim of this work was to study different types of endoglucanases in improvement of fibre reactivity at high consistency. The study employed well characterised endoglucanases from structural families 5, 7 and 45 with and without a CBM to clarify which enzyme properties are most crucial in improving fibre reactivity. Various analytical techniques were used to evaluate fibre-level, microfibril-level and polymer-level changes in fibres that are related to fibre reactivity. Reactivity of the enzyme treated fibres was studied using two novel methods that track fibre dissolution in cupriethylenediamine (CED), a well-known alkaline cellulose solvent. Purified monocomponent cellulases were used for the pulp treatments. The GH5 and GH7 endoglucanases with and without a CBM (from Trichoderma reesei) were readily available at VTT. The GH45 endoglucanase was obtained through collaboration with ROAL Oy. The GH5 + CBM and GH7 + CBM enzymes were the native T. reesei Cel5A (former EGII) and Cel7B (former EGI), respectively. Both enzymes possess a CBM. The CBM-deleted variants of Cel5A (GH5 core) and Cel7B (GH7 core) were obtained after protease digestion of the native enzymes. Production and purification of GH5 + CBM, GH5 core, GH7 + CBM and GH7 core were carried out as described by Suurnäkki et al. (2000). Heterologous production of GH45 and GH45 + CBM was carried out in a recombinant Trichoderma reesei strain as described in Haakana et al. (2004) and Szijártó et al. (2008). The GH45 enzyme was the native endoglucanase from Melanocarpus albomyces (MaCel45A) and GH45 + CBM was an engineered variant of MaCel45A with a linker and a CBM from T. reesei Cel7A (Szijártó et al. 2008). Expression and purification of the GH45 enzymes was done as published previously (Szijártó et al. 2008; Rahikainen et al. 2013). Dried bleached softwood kraft pulp from a Finnish pulp mill was used in this work. The pulp comprised 80.3% of cellulose, 10.4% of xylan, 8.4% of glucomannan and 0.9% of lignin. Prior to the enzyme treatments the pulp was cold disintegrated according to SCAN-C 18:65, except that the amount of pulp was 50 g (oven dry) and the pulp was mixed with 2.5 l of deionized water. Disintegration was followed by vacuum filtration (60 μm) where after the pulp was homogenized with a Kenwood food mixer with a K-shaped blade. The enzymatic pulp treatments were carried out at 20% and at 1% (w/w) dry matter in 200 mM sodium phosphate buffer (pH 6) at 50 °C for 1 or 2 h. Reference treatments were done similarly, but without enzyme addition. Enzyme dosages of 0.025–1 mg protein/g of oven dry pulp were used. The used dosages were based on a previous study of the research group (Grönqvist et al. 2015). At the high consistency treatments the enzymes were added by spraying prior to mixing to ensure an even distribution of the enzyme into the pulp. The high consistency treatments were carried out in a 2 CV DIT helicone mixer (Design Integrated Technology Inc., Virginia, USA) using 250 rpm constant mixing. The low consistency treatments were carried out in a beaker using constant blade mixing. The high consistency treatments were terminated by diluting the samples with boiling water to 5% (w/v) dry matter content followed by incubation at 100 °C for 30 min. After the high consistency treatment, liquid sample for sugar analysis was squeezed out from the fibre mass using a mesh bag. The low consistency samples were treated similarly without sample dilution. The pulp samples were vacuum filtrated (60 µm) and the filtrate was recycled once through the fibre mass. The pulp was washed using deionized water. After the enzymatic pulp treatments, the solubilized sugars were subjected to a mild (4%) sulphuric acid hydrolysis (1 h, 120 °C) to degrade oligomeric carbohydrates to monomers prior to a quantitative analysis. The solubilised monomeric carbohydrates were analysed using high-performance anion exchange chromatography with pulsed amperometric detection (HPAEC-PAD). HPAEC was run with a Dionex ICS-3000 equipment (Dionex Corp., Sunnyvale, CA, USA) using a previously published protocol (Tenkanen and Siika-aho 2000) with minor modifications (equilibration with 15 mM NaOH and isocratic elution with water). In the calculations, xylose and arabinose were considered to originate from softwood xylan and mannose. Galactose and glucose (1/4 of the amount of mannose) were considered to originate from softwood galactoglucomannan. Electron and light microscopy techniques were used to visualize changes in the fibre morphology. For scanning electron microscopy (SEM), a small amount of the pulp was fast frozen in liquid propane. The frozen pulp specimens were then placed on a mould and left in a freeze-dryer for 24 h. Water was removed from the frozen state by sublimation in the vacuum oven. The dried pulp samples were mounted on Aluminium studs with double-sided carbon tapes and coated with Au/Pd with an Emitech K100X sputter coater for 1.5 min. The samples were imaged with a Zeiss Sigma VP microscope. A secondary electron detector was used for capturing images at an accelerating voltage of 3 kV. For transmission electron microscopy (TEM) the pulp samples were fixed with 2.5% gluteraldehyde followed by staining with 1% (w/v) KMnO4 for about an hour. The pre-fixed pulp specimens were dehydrated in ascending series (60%, 70%, 80%, 90% and 99.9%) of ethanol for about 10 min in each concentration. The dehydrated pulp samples were embedded in SpeciFix-20 epoxy resin (Struers) before sectioning. Ultrathin transverse sections of about 200 nm were cut in distilled water at room temperature with a diamond knife on a Leica EM FC7 ultra-microtome. The sections were collected on 600 mesh hexagonal Cu grids. The sample preparation protocol for the TEM analysis of wood fibre specimens can be found in details in Reza et al. (2015). The ultrathin pulp-resin sections were studied with a cryo-TEM (Jeol JEM-3200FSC) at an accelerating voltage of 300 kV. Micrographs were recorded using a Gatan Ultrascan 4000 CCD camera. The imaging was performed using zero-loss energy filtering (Omega type) with a slit width of 20 eV. Specimen temperature was maintained at − 187 °C with liquid N.
For the light microscopy, the pulp samples were first stained with Congo red with a 1% (w/v) aqueous stain solution. The stain was mixed in 1:1 (v:v) ratio with the wet pulp. Dyed sample (100 µl) and water (100 µl) was added to a microscope glass. The samples were imaged with an Olympus BX61 microscope equipped with Olympus WH10X-H-oculars and an Olympus ColorView12-camera using Analysis Pro 3.1-software (Soft Imaging System GmbH). The intrinsic viscosity of the pulps was determined according to ISO 5351-1 using a PSL Rheotek equipment (Poulten, Selfe & Lee Ltd, UK). Samples were analysed in duplicates. A fibre image analyser (Fibermaster STFI, Lorenzen&Wettre) was used to analyse the fibre length, width and fines of the modified pulps. Molecular weight distributions of the pulp samples were determined after sample dissolution in DMAc/8% LiCl according to the solvent exchange method with ethyl isocyanate derivatisation (Berthold et al. 2001). After complete dissolution, the samples were diluted with DMAc providing final LiCl concentration of 0.8%. The samples were filtered (0.45 µm) before size exclusion chromatography (SEC). The SEC measurements were performed using 2 × PL gel MiniMixed A columns with a precolumn in DMAc/0.8% LiCl eluent (0.36 ml/min, T = 80 °C). The elution curves were detected using a Waters 2414 Refractive index detector. The molar mass distributions (MMD) were calculated against 8 × pullulan (6100–708,000 g/mol) standards, using Waters Empower 3 software. Two replicates (including sample dissolution and chromatographic run) were analysed from each pulp sample. The total pore volume (Fibre saturation point (FSP)) and volume of micropores was measured using a two-point solute exclusion method (Manninen et al. 2013; Grönqvist et al. 2014). The solute exclusion technique was originally developed by Stone and Scallan (1967, 1968). In this method, the water inaccessible to a non-interacting probe polymer is analysed. For the measurement of the total pore volume (FSP) 2 × 106 Dalton dextran probes with a Stokes diameter of 54 nm were used. This probe is so large that it does not penetrate into the fibre. The second measurement was done with 5 × 103 Dalton dextran probes with a 3.6 nm Stokes diameter. This polymer penetrates into the cell wall but not into the fibril aggregates (Manninen et al. 2013). We refer to the water inaccessible to this polymer as “microporosity”. The microporosity includes water trapped in the hemicellulose network on fibril surfaces, water within the fibril aggregates themselves and any water in small pores less than 3.6 nm between fibril aggregates. The drawback of the method is that various interactions of dextran with the fibre surface may bias the results (Manninen et al. 2013) and any pores larger than 54 nm are not included in the measurement. Duplicate analysis was carried out from each pulp sample. The accessibility of OH groups was studied with a method based on dynamic vapour sorption (DVS) coupled with deuterium exchange (Väisänen et al. 2018). During the measurement, the accessible OH groups are exchanged to OD groups and the amount of exchanged groups is calculated from the resulting weight gain. Thus the method allows direct quantification of the accessible OH groups in a sample. The measurements were carried out at room temperature with a DVS Advantage ET (elevated temperature) apparatus (Surface Measurement Systems Ltd, UK) which has a measuring accuracy of 0.1 µg. The samples (10–11 mg) were first dried with dry N2 (99.95%, Oy AGA Ab, Finland) to remove any excess water. Then, the samples were rewetted with D2O vapour (99.9 atom-% D, Sigma Aldrich, St. Louis, USA) with a relative humidity of 95% until an equilibrium was reached. Finally, the samples were dried again the same way as the initial drying. The amount of accessible OH groups was calculated according to Eq. 1, in which the atomic mass difference between D and H is approximated to be 1 g/mol. where A is the amount of accessible OH groups in a dry sample (mol/kg), mi is the dry mass of a sample before the D2O exposure (mg) and mf is the dry mass of a sample after the D2O exposure (mg). The reported accessibility values of the pulps are the mean values of three replicate measurements. Fibre dissolution in cupriethylenediamine (CED) was studied using two different methods. Firstly, a modified version of the Dissolution-based Torque Reactivity (DTR) Test was used (Ceccherini and Maloney 2017). In this test, the dissolution rate of pulp is measured indirectly by tracking the rheological behaviour of a dissolving pulp suspension. High dissolution rate and short dissolution time indicate high pulp reactivity. The reactivity analysis was carried out at 23 °C using a Physica MCR 300 rheometer (Anton-Paar, Physica Messtechnik GmbH, Germany) equipped with a 4-bladed-vane and corresponding basket geometry. The vane was set at 0.5 mm from the basket bottom. Prior to dissolution, the fibre suspension (1.5% w/v) was homogenized for 5 min at 200 s−1 shear rate. Then, the fibre dissolution was initiated by injecting 12.5 ml of 1M CED (Sigma Aldrich). The dissolution was monitored by measuring the variation of torque while the shear rate remained constant (200 s−1) throughout the measurement. The plot of torque as a function of time resulted in a curve that could be divided into four consecutive phases: an initial drop (corresponding to mixing of fibre suspension with CED), a short linear increase followed by a nonlinear increase (corresponding to fibre dissolution) and a final constant plateau (corresponding to completed dissolution). The time point, in which the torque plateau was reached, represents the overall dissolution time. This time is determined as the point, in which the torque to time ratio decreases below 0.1 µNm/s (Ceccherini and Maloney 2017). The pulp samples were analysed in triplicates. In the second method, the dissolution rate of fibres was monitored under microscope utilising an automatic image and video processing method. This recently published method (Mäkelä et al. 2018) was slightly modified to speed up data collection and analysis. The pulp was dispersed in water and a droplet containing dozens of fibres was placed on a glass slide and allowed to dry at 30 °C. For each imaging round 2–3 fibres were selected, placed on a microscopy slide and covered with a cover slip. From each pulp sample, altogether ca. 20 fibres were monitored. Imaging was carried out using a Zeiss AxioImager M.2 microscope (Carl Zeiss GmbH, Göttingen, Germany). A drop of aqueous 0.2 M CED (Oy FF-Chemicals Ab, Haukipudas, Finland) was added between the microscopy slides and a transmission image was captured after the CED addition every 1.0 s using the time series mode until the fibre was dissolved. The images were taken either with a 2.5× objective (Zeiss EC Plan-Neofluar, numerical aperture of 0.085, Zeiss) or with a 5× objective (EC Plan-Neofluar, numerical aperture of 0.16, Zeiss) and polarizer in the angle of 75°. Micrographs were obtained using a Zeiss Axiocam 506 CCD colour camera (Zeiss) in black and white mode and the Zen imaging software (Zeiss). The dissolution videos were analysed using automatic image and video processing methods. As a pre-processing step, images before wetting with CED were discarded automatically by analysing the sum of pixel-wise second derivative along time between consecutive images. The absolute minimum was consistently reached when the microscopy slides were uniformly wetted with CED. Then, each frame of the video after wetting was binarized using a maximum entropy threshold, which maximizes information between objects and the background (Kapur et al. 1985). The objects were detected in binary images using 8-connected component analysis (Molinier et al. 2005), then assigned a unique label and their corresponding area. The fibre tracking procedure was initialized by selecting the n largest objects in the first image, with n the number of fibres indicated as metadata by the microscope operator. The fibres were then tracked using a spatio-temporal consistency criterion inspired by (Molinier et al. 2005), that allowed to match candidate fibres in the current binary image with fibres tracked in the previous images, while simultaneously filtering out other objects (occasional non-fibrous material, air bubbles and other artefacts). The choice of the enzyme type is of major importance in improvement of fibre reactivity and there is a clear need for published information on the applicability of different enzymes for reactivity improvement. Many studies have exploited commercial enzyme preparations where there is limited amount of published data available on the enzyme characteristics. For this study, endoglucanases representing families 5, 7 and 45 were of particular interest due to their current use in industrial enzyme cocktails for cellulose hydrolysis and modification. Family 5 and 7 endoglucanases are known to be well represented in enzyme cocktails targeted for total hydrolysis of lignocellulose (Kallioinen et al. 2014) and family 45 endoglucanases are prevalent in commercial enzyme products targeted for pulp applications (Ibarra et al. 2010). The role of enzyme family and structure in fibre modification was systematically studied at high consistency (20% w/w). Low consistency conditions (1% w/w) were studied using GH45 + CBM. Enzyme variants with or without a carbohydrate binding module (CBM) (i.e. core enzymes) were used. The CBMs in all enzymes were of type 1, which forms specific interactions with cellulosic surfaces (Várnai et al. 2014). Biological origin and the key characteristics (size, pH optimum, temperature optimum) of the enzymes used are listed in Table 1. The same pH and temperature conditions (pH 6, 50 °C) were employed in all enzyme treatments although based on literature, for the GH7 and GH5 enzymes a lower pH (ca. pH 5) and for the GH45 enzymes a higher temperature (60–70 °C) would have been more optimal (Miettinen-Oinonen et al. 2004; Qin et al. 2008; Boonvitthya et al. 2013; Chokhawala et al. 2015). It should, however, be noted that the optimal conditions have been determined on model substrates, not wood fibres. Wood fibres have been shown to protect most enzymes, enabling thus modification in less optimal conditions. The enzyme loading (0.2 mg enzyme protein/g oven dry pulp) most commonly used in this study has previously shown to improve fibre reactivity for the Biocelsol process (Grönqvist et al. 2015). It seems that the low enzyme dosage is sufficient if the treatment is done at high consistency with mixing (combined mechano-enzymatic treatment). When mixing is not used at high consistency, higher enzyme loading or longer treatment time can compensate the lack of mechanical action (Wang et al. 2015; Li et al. 2018b). During enzymatic fibre treatments, yield losses due to carbohydrate dissolution take place. An optimal treatment would greatly improve fibre reactivity with minimal yield losses and in this study, yield losses with all studied enzymes were below 2.5 w% of total fibre mass (Fig. 1). The primary reaction of endoglucanases is to randomly cleave the linkages between glucose units in the middle of cellulose chains. Therefore, the action of the different endoglucanases could be compared by analysing the amount of carbohydrates released during the enzyme treatments. After enzymatic fibre treatment the dissolved carbohydrates were determined from the liquid fraction after mild acid hydrolysis of oligomeric sugars followed by liquid chromatography quantification of the resulting monomeric sugars. The results are shown as yield loss (w%) of fibre dry weight (Fig. 1). The highest yield losses at high consistency were observed after treatment with the GH7 enzymes (> 2 w%) whereas the lowest yield losses were observed after treatment with the GH5 enzymes (< 1 w%). Treatment at high consistency was found to enhance the enzyme action more than sixfold when fibre treatment at high and low consistencies were compared with the GH45 + CBM enzyme. With the same enzyme dosage (0.2 mg/g), 1.9% and 0.3% of fibre dry weight was solubilised at high and low consistency, respectively (Fig. 1). The obtained results are in line with previously published work showing that combined mechanical and enzymatic treatment at high consistency generates a synergistic effect which enables efficient enzyme action on the fibres (Grönqvist et al. 2015). 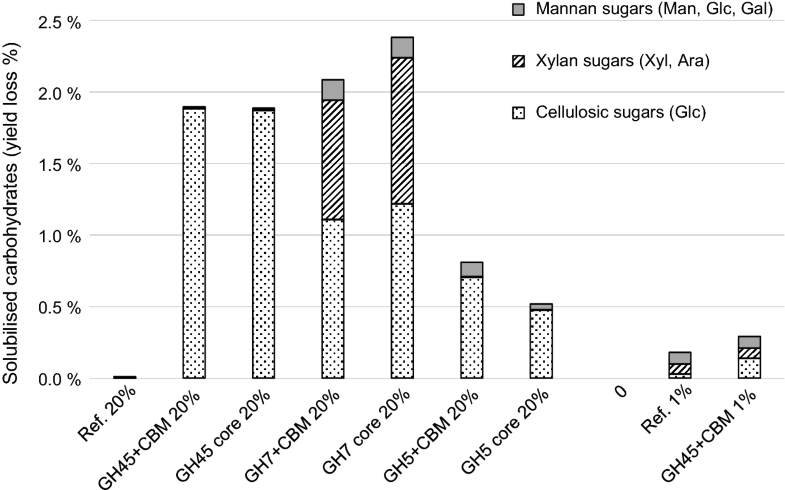 The GH45 enzymes were found to act solely on cellulose, whereas high xylanase side activity and low mannanase side activity was observed with the GH7 enzymes. The GH5 enzymes had a low mannanase side activity. The bleached softwood kraft pulp contained 10.4 w% of xylan and 8.4 w% of glucomannan, which means that ca. 10% of pulp xylan was solubilized with the GH7 enzymes, and less than 1% of the glucomannan was solubilized with the GH7 and GH5 enzymes. These findings are consistent with a previous study showing that GH7 and GH5 endoglucanases generally also act on xylan and mannan, respectively, and that GH45 enzymes typically lack side activities on hemicelluloses (Vlasenko et al. 2010). The results are interesting for many applications as the choice of endoglucanase can be used to tailor the composition of released carbohydrates. 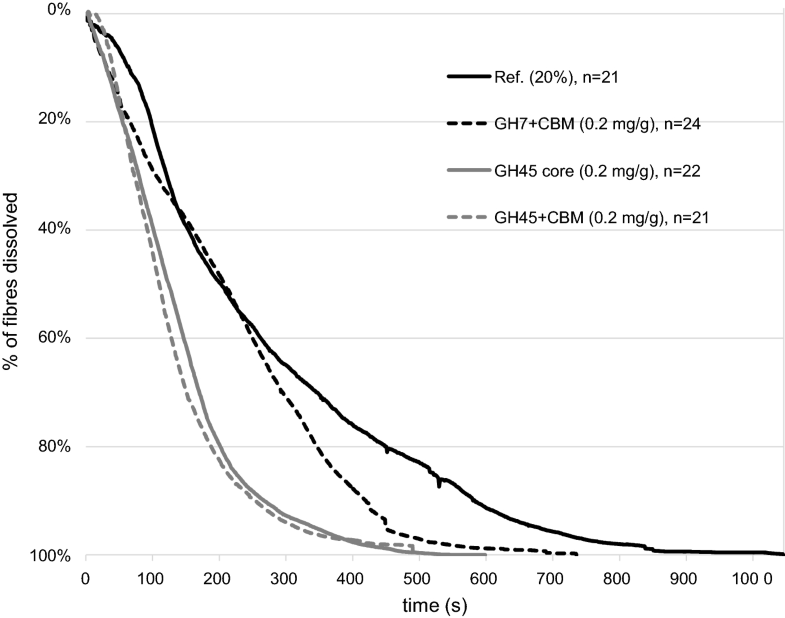 With the GH45 endoglucanases the presence of a CBM did not have an effect on the released carbohydrates at high consistency and with the GH7 and GH5 enzymes the effect was only modest (Fig. 1). In a previous study the same GH5 and GH7 enzymes that were used in this study were shown to release more soluble carbohydrates when CBM was present in the enzyme structure (Suurnäkki et al. 2000). This is likely due to the low dry matter conditions used in the study by Suurnäkki et al. (2000). In total hydrolysis applications, CBMs are considered to be beneficial for enzyme action at low dry matter conditions, whereas at high dry matter the beneficial effect of a CBM has been shown to diminish (Várnai et al. 2013). Consistently, the same effect seems to apply also in fibre modification: the CBM enhances enzyme action only at low consistency whereas at high consistency the CBM is not needed to increase enzyme adsorption to the substrate due to close packing of enzymes and substrate. The high consistency conditions in fibre modification seem to promote enzyme adsorption to the cellulosic substrate (Wang et al. 2015) which counterbalances the need for a CBM (Várnai et al. 2013). Electron and light microscopy techniques were used to visualize changes in fibre morphology after the enzymatic treatments. Morphological changes such as surface fibrillation and fibre wall delaminations may indicate improved fibre reactivity and can be detected with microscopic methods. Transmission electron microscopy was used to compare the effect of high (20%) and low consistency (1%) with and without enzyme (GH45 + CBM) on fibre morphology. High dry matter consistency in the fibre treatment was shown to induce major changes in fibre morphology which were further enhanced when the high consistency treatment was done with the enzyme (Fig. 2). According to the transmission electron micrographs taken of transverse sections of fibres (Fig. 2), the treatment at high consistency without an enzyme seemed to cause delamination of the S2 layer of the fibre cell wall (Fig. 2a). Delamination could not be observed after the low consistency treatment without enzyme (Fig. 2b). Delamination of the cell wall layers was likely caused by the mechanical forces generated due to fibre–fibre friction, which did not occur at low consistency where excess amount of water was present. The high consistency pulp treatment combined with the enzyme (GH45 + CBM) was found to further enhance delamination and increase the void volume between the delaminated cell wall layers (Fig. 2c). The fibre walls after the enzyme treatment at low consistency did not appear visually different from the fibres treated at low consistency in the absence of the enzyme (Fig. 2d). More enzyme adsorption to the cellulosic substrate occurs at high consistency (Várnai et al. 2013) which is likely to promote the formation of enzyme–substrate complex and catalysis. This study further supports the finding that combined mechano-enzymatic treatment at high consistency can further improve enzyme action in fibre modification for improved reactivity (Grönqvist et al. 2015). Scanning electron microscopy (SEM) and light microscopy were carried out to visualize changes introduced by the different enzymes to pulp fibres. Scanning electron micrograms of pulp samples treated with GH45 + CBM, GH7 + CBM and GH5 + CBM at high consistency are shown in Fig. 3. In SEM and light microscopy images the pulp samples treated with the corresponding CBM-free enzymes (GH45 core, GH7 core and GH5 core) appeared highly similar as the fibres treated with their CBM-containing counterparts (see an example in supplementary data S5). Thus the CBM did not have a detectable effect on fibre appearance visualized by SEM and light microscopy. The fibre surfaces treated with GH45 + CBM appeared most damaged (Fig. 3b) compared to the fibres treated with GH5 + CBM (Fig. 3c) and GH7 + CBM (Fig. 3d) which appeared smooth and highly similar to the fibres treated in the absence of the enzyme (Fig. 3a). The treatment at high consistency with GH45 + CBM seemed to peel off most parts of the fibre surface and left the cell walls with a rough appearance (Fig. 3b). The light microscopy images supported the finding that the treatment with GH45 + CBM was most efficient in altering fibre morphology compared to GH7 + CBM and GH5 + CBM. In the light microscopy images the fibres appeared fragmented after high-consistency treatment with GH45 + CBM (S1, panel b in electronic supplementary material). This could not be seen after the treatment with the other enzymes, i.e. GH7 + CBM and GH5 + CBM (S1, panels e–f). Fibre fragmentation at high consistency with GH45 enzymes was also evident from the results obtained from the fibre image analyzer (Table 2). For instance, averaged fibre length after treatment with GH45 core was 0.75 mm compared to the 1.76 mm after the reference treatment without enzyme (Table 2). Interestingly, fibre fragments were shorter after treatment with GH45 core (0.75 mm) than after treatment with GH45 + CBM (0.89 mm). Consistently, the amount of fines was higher after treatments with GH45 core than with GH45 + CBM. 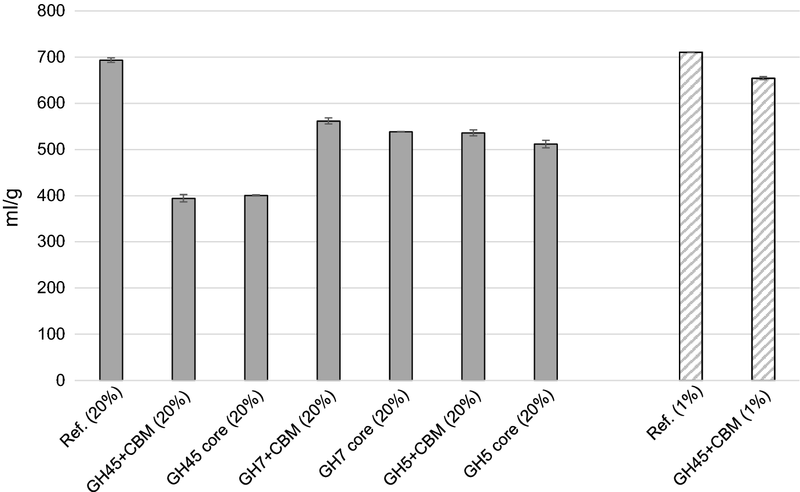 This suggests that the CBM-free enzyme (GH45 core) has acted somehow different or more efficient compared to the CBM-containing structural variant of the enzyme (GH45 + CBM). Fibre fragmentation did not occur when the fibres were treated with GH7 + CBM at high consistency (Table 2). The combined action of enzyme (GH45 or GH45 + CBM) and shear forces at high consistency was clearly causing the fibre fragmentation since the low consistency treatment with GH45 + CBM did not result in visual changes in fibre morphology (S1, panels c–d). The fibre widths were slightly increased after enzyme treatments at high consistency, especially after treatments with the GH45 enzymes (Table 2). The increase may be explained by fragmentation of the fibres and formation of shorter and wider fragments in the sample. However, further work would be needed to study whether the increase would also result from fibre swelling. Increased fibre porosity is linked to improved fibre reactivity due to better solvent or chemical access to the inner layers of fibres. After enzymatic fibre treatments, fibre porosity was measured using a two point solution exclusion method that employs dextran probes of two different sizes enabling thus measurement of both total and micropore volumes. The total pore volume (fibre saturation point) is a measure of total fibre swelling whereas the micropore volumes indicate the water present in 3–4 nm in diameter pores. The high consistency treatment of fibres resulted in higher total and micropore volumes compared to the low consistency treatment, even when enzymes were not used (Table 3). The results were consistent with the TEM findings (Fig. 2a, b), which showed delamination of the cell wall layers during the high dry matter treatment. Consistently, pulp porosity has previously been shown to increase with mechanical shredding at high pulp consistency (Grönqvist et al. 2014). Combined mechano-enzymatic treatment with GH45 enzymes was found to be most efficient in increasing fibre porosity. At high consistency, the family 45 enzymes were found to further increase the total pore volume and especially the micropore volume of the fibres. When compared to the high consistency treatment without an enzyme, the micropore volume increased from 0.56 to 0.68 ml/g and 0.7 ml/g when the GH45 + CBM and GH45 core enzymes were used, respectively (Table 3). These results further support the conclusion made from the TEM images (Fig. 2c), i.e. it seems that the GH45 enzyme can penetrate into the fibril network loosened by the high consistency treatment and enlarge the micropores within the fibre walls. The GH7 and GH5 enzymes were not found to increase the micropore volume, but some increase in the total pore volume was observed after GH7 + CBM, GH7 core and GH5 + CBM treatments. This is likely because the enzymes are able to act on fibre surfaces and loosen the packing of the outermost fibre wall layers. Interestingly, for GH45 and GH7 enzymes the core enzymes resulted in higher total pore volumes than their CBM-containing counterparts. The highest total pore volume (1.11 ml/g) was measured after treatment with GH45 core at high consistency (Table 3). Among the studied enzymes GH45 core is the smallest and therefore it may also have the best accessibility to the fibre wall pores and thus capability to loosen the fibril network. Complementary techniques to measure fibre porosity in wet stage should be applied in the future to better understand the morphological changes introduced by enzymes with and without a CBM. The total and especially the micropore volumes after GH5 core treatment were low compared to the reference treatment at 20% consistency. The exceptionally low micropore values are not in line with other observations of GH5 core activity (Fig. 1, Table 2), but it is clear that the GH45 core treatment was not efficient in increasing fibre porosity. Enzyme treatment at low dry matter conditions (1%) with GH45 + CBM did not have an effect on the micropore volume indicating that the enzyme could not penetrate the fibre wall. Total pore volume was increased from 0.83 ml/g (1% treatment without enzyme) to 0.89 ml/g (1% treatment with GH45 + CBM) indicating that the enzymes could act only on the most accessible parts of the fibres. Enzyme dimensions may be critical in explaining the better access of the GH45 enzymes to the inner parts of the fibres compared to the GH7 and GH5 enzymes. Diameters of the catalytic core modules, measured computationally from the thinnest and widest points of the globular molecule structures are shown in Table 1. The size of the GH45 catalytic module is small (3 × 5 nm) compared to the bulkier GH7 (4 × 7 nm) and GH5 (4 × 6 nm). It may be that the catalytic domains of the GH45 enzymes are small enough to access the porous network generated by the high consistency treatment (Fig. 2a) and thus expand the micropore volumes. Interestingly, the GH45 variant with a CBM was found to increase micropore volume to a similar extent as the GH45 core. 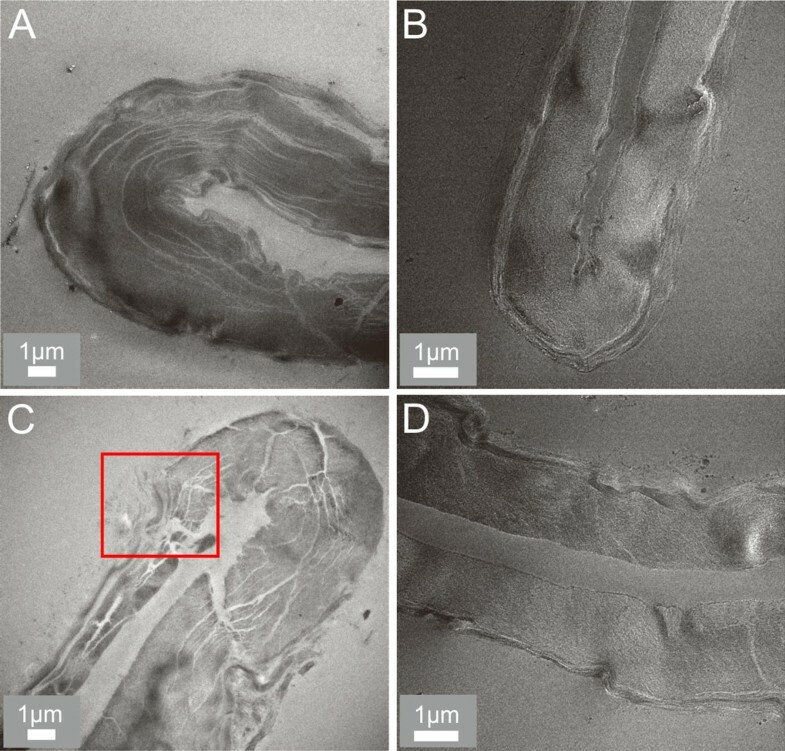 This indicates that the size and shape of the CBM of GH45 and the connecting linker is not limiting enzyme mobility and access in the fibre walls. In all the studied enzymes with a CBM, this ca. 3 nm wedge-shaped domain is connected to the catalytic domain through a flexible rope-like peptide linker (Kraulis et al. 1989). For instance, the linker in the GH7 + CBM enzyme is ca. 6–7 nm in length when fully extended (Sammond et al. 2012) and it connects the 4 × 7 nm globular catalytic domain with the 3 nm CBM. In future work, size should be one parameter to consider when novel enzymes are being screened for fibre modification applications. Viscosity and analysis of molecular weight distribution indicate how much the cellulosic polymer chains in fibres have shortened during the enzymatic fibre treatments. Lower degree of polymerisation of cellulose is correlated with easier dissolution (Li et al. 2018a). The effect of the enzyme treatments on pulp viscosity (Fig. 4) and molecular weight distribution (Fig. 5) was studied. At high consistency, the GH45 enzymes were the most efficient in lowering pulp viscosity (from 690 to 400 ml/g) whereas the viscosity reduction with the GH7 and GH5 enzymes was less pronounced (from 690 to 500–550 ml/g). The profound effect of the GH45 enzymes in viscosity reduction is likely due to the specific action of GH45 enzymes on the high Mw cellulose in pulp, which is evident from the Mw distribution results (Fig. 5). It has been reported previously that the GH5 + CBM enzyme used in this study reduces pulp viscosity more efficiently than the GH7 + CBM enzyme (Pere et al. 1995; Rahkamo et al. 1998; Suurnäkki et al. 2000). This could, however, not be seen in the conditions used in this study. It is possible that the high consistency or non-optimal pH were affecting the action of the GH5 enzymes. The GH7 enzymes were found to solubilize more of the pulp cellulose compared to the GH5 enzymes in this work (Fig. 1), whereas at lower pH (pH 5) and at low consistency (5%) the opposite has been reported (Suurnäkki et al. 2000). 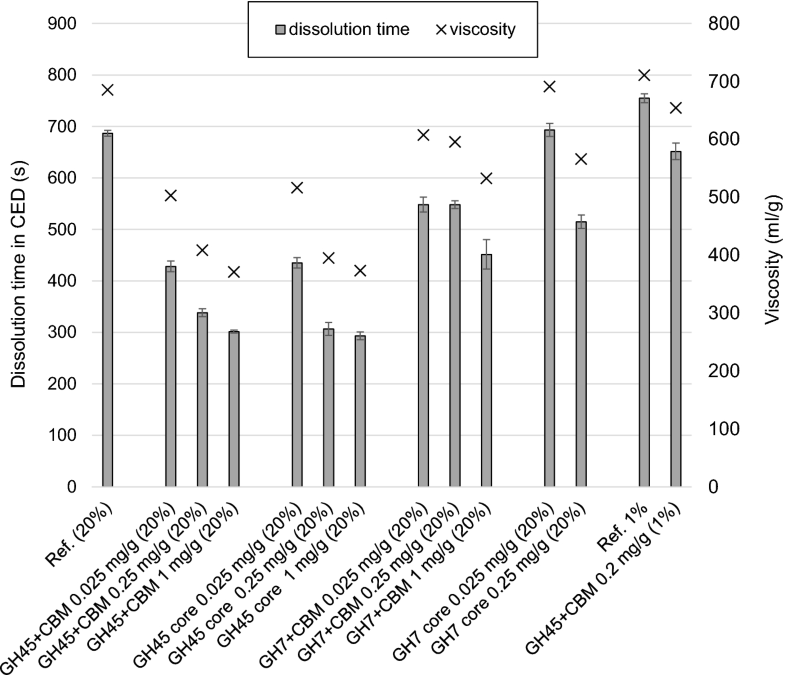 Viscosity reduction measured after the low consistency treatment with GH45 + CBM was moderate, from 710 to 650 ml/g, further supporting the finding that enzyme action at high consistency is significantly enhanced due to combined mechanical and enzymatic action. At high consistency the presence of a CBM did not have any effect (GH45 enzymes) or only a minor effect on pulp viscosity. The pulp viscosity was slightly lower when the enzyme did not carry a CBM (GH7 and GH5 enzymes) (Fig. 4). The molecular weight distribution of the reference sample showed a typical shape for a kraft pulp with two overlapping distributions: one for hemicellulosic polymers (low Mw distribution peaking at ca. 32 kDa) and one for cellulosic polymers (high Mw distribution peaking at ca. 400 kDa) (Fig. 5). The GH45 + CBM had the most drastic effect on the Mw distribution: molecular weights of the long cellulose chains were efficiently reduced but the hemicellulosic sugars remained intact which resulted in a significant increase in the low Mw polymeric chains. The GH7 + CBM and GH5 + CBM had similar effects on the high Mw cellulosic fraction: the distributions were slightly shifted towards lower Mw. However, GH7 + CBM was found to degrade hemicelluloses (Fig. 1) which generated a stronger shift of the low Mw end of the distribution towards even lower molecular weights compared to the GH5 + CBM enzyme. Weight and number average molecular weights and polydispersities of the enzyme treated samples are shown in Table 2. The narrowest distribution according to the polydispersity index was generated with the family 45 enzyme (8.8) (Table 2), which acted solely on cellulose whereas the broadest distribution was created with the GH7 enzyme (11.5), which was shown to act both on hemicelluloses and cellulose. Dynamic vapor sorption (DVS) coupled with deuterium exchange was applied in determining the amount of hydroxyl (OH) groups accessible for deuteration in pulp. The cellulose OH-groups in pulp that are accessible to deuterium exchange are also likely to be accessible for other chemicals and thus the method can be used as one measure of pulp reactivity after the enzymatic treatments. The OH accessibilities of the samples treated with the GH7 core and GH45 core enzymes at high consistency were studied with a method based on dynamic vapour sorption (DVS) coupled with deuterium exchange (Väisänen et al. 2018) and compared against the reference sample treated at high consistency without an enzyme. The pulp treated with the GH45 core had the highest OH accessibility (10.5 mol/kg) (S2 in electronic supplementary material). The OH accessibility was found to increase by 3% compared to the reference. The change in the OH accessibility can mostly be explained by the increase of porosity and fibre swelling induced by the enzyme treatment. No clear differences in the OH accessibilities between the reference and the GH7 core treated sample could be detected. The DVS results are consistent with the porosity values (Table 3) showing that the GH45 core treatment increased the total pore volume and especially the micropore volume more than the GH7 core enzyme treatment. Fibre dissolution in cupriethylenediamine (CED) was used as a general test for fibre reactivity and a tool to evaluate fibre susceptibility towards dissolution. Two novel methods were employed: a dissolution-based torque reactivity (DTR) test (Ceccherini and Maloney 2017) as well a microscopic method (Mäkelä et al. 2018). The DTR test enables monitoring of the bulk dissolution process of a pulp, whereas the microscopic method provides more insight to the dissolution kinetics of individual fibres. Typically, the Fock test is used to measure fibre reactivity (Li et al. 2018a). However, the Fock assay is linked to fibre dissolution in the viscose process which goes via cellulose derivatisation. The attempt in this study was to use assays that would measure fibre tendency to dissolve in highly alkaline conditions prevalent e.g. in the Biocelsol process (Grönqvist et al. 2015). Results from the DTR test after enzyme treatments with varying enzyme dosages are shown in Fig. 6. The pulp treatment at high consistency without enzyme decreased sample dissolution time ca. 70 s compared to the pulp treatment at low consistency (Fig. 6). As expected, the enzyme treatment at high consistency further decreased the sample dissolution time. Pulp viscosity was found to correlate clearly with dissolution time in 1M CED (Fig. 6 and S3 in electronic supplementary material). The GH45 enzymes with and without a CBM were found to be the most efficient in reducing the time necessary for sample dissolution in CED. Interestingly, with the GH45 core enzyme, lower enzyme dose (0.25 mg/g) was needed to reach 300 s dissolution time compared to GH45 + CBM which required 1 mg/g dose to reach the same dissolution time. The GH7 or GH5 enzyme treatments did not decrease the dissolution times of the pulps as effectively as the GH45 enzymes. The effect of different endoglucanases on cellulose reactivity has been previously studied and a commercial endoglucanase preparation containing a GH45 enzyme (formerly called EGV) was found to reduce pulp viscosity and increase Fock reactivity of the pulp more efficiently than a GH7 enzyme (formerly called EGI) (Ibarra et al. 2010). In the microscopic method, dissolution of individual fibres in 0.2 M CED was followed under a light microscope and the dissolution kinetics were analysed from the video data using automatic image and video processing methods. Examples of dissolution videos are available as electronic supplementary material (S4). The averaged dissolution curves of ca. 20 individual fibres from each high-consistency enzyme treated sample are shown in Fig. 7. It has previously been noted (Mäkelä et al. 2018) that different fibre types in bleached softwood kraft pulp show great variation in dissolution times and dissolution mechanisms. Therefore, sufficient number of individual fibres needs to be analysed in order to get a reliable averaged dissolution time. In the reference sample, fibre dissolution occurred almost exclusively via the ballooning mechanism (see supplementary video S4). In this type of fibre dissolution, certain areas of the fibre dissolve faster than others forming balloon-like shapes throughout the fibre length (Le Moigne et al. 2008). After treatment with the GH45 enzymes, the fibres dissolved more evenly and ballooning did not occur, suggesting that the GH45 enzymes were effective in degrading the structures in fibres that restrict fibre swelling. Since the GH45 enzymes are unable to attack hemicelluloses, the restricting structures must be composed of cellulose. Treatment with the GH7 was found to reduce ballooning but did not remove it as efficiently as the GH45 enzymes. This is likely because the GH7 endoglucanase had lower activity on cellulose compared to the GH45 enzymes (Fig. 1). As expected, the reference sample, treated at high consistency without enzymes, dissolved the slowest whereas the enzyme treated samples showed faster dissolution. The reference sample reached 95% dissolution threshold on average after ca. 680 s whereas the GH7 and GH45 treated samples were 95% dissolved on average after ca. 450 and 330 s, respectively. The CBM in the GH45 enzyme had no effect on fibre dissolution. The results correlate well with the results obtained with the viscometric method (Fig. 6), suggesting that the averaged dissolution curves obtained from the microscopic method describe well the dissolution properties of the bulk sample. The role of enzyme family and enzyme structure in fibre modification at high consistency was assessed in the present work using endoglucanases from three structurally different glycoside hydrolase (GH) families (5, 7 and 45). Enzyme variants with and without a carbohydrate binding module (CBM) were used. Enzyme adsorption to the cellulosic substrate, which is a prerequisite to catalytic action, is known to increase at high consistency (Várnai et al. 2013). In this study, fibre mixing at high consistency was shown to further enhance enzyme action by making the fibre structure more accessible for the enzymes. Total hydrolysis of cellulose is shown to be impeded at high consistency (Kristensen et al. 2009) which is contrary to what this study and previous groups have reported in the field of enzymatic fibre modification (Grönqvist et al. 2015; Wang et al. 2015). The cause for these contradictory findings is most likely in the reaction times and in the targeted degree of hydrolysis in the different applications. For improved fibre reactivity, low degree of hydrolysis (< 3% w/w) and short reaction times (1–2 h) are targeted whereas for total hydrolysis, complete degradation of cellulose is aimed for which takes a substantially longer time (e.g. 24 h). As concluded by Kristensen et al. (2009), total hydrolysis at high consistency is hampered by accumulation of hydrolysis products (dissolved sugars) that at high concentrations inhibit enzyme adsorption and thus prevent progression of catalysis. Enzymatic fibre modification at high consistency does not suffer from accumulation of dissolved sugars due to the low degree of hydrolysis which is needed for improved fibre reactivity. In these conditions the high consistency conditions may translate directly to improved enzyme action due to higher enzyme adsorption whereas in total hydrolysis the effect can be masked by the accumulation of hydrolysis products that prevent enzyme binding. The GH45 endoglucanases with and without a CBM were the most effective enzymes in decreasing the viscosity and degree of polymerization of the pulp. These enzymes were shown to degrade cellulose exclusively. The GH45 endoglucanases were also the most effective in increasing the micropore volumes of the pulp, suggesting that these enzymes may penetrate into the small pores in fibre cell walls and thus have better access to the cell wall carbohydrates. Contrary to the GH45 enzymes, the GH family 5 and 7 endoglucanases were also shown to degrade the hemicelluloses in pulp. According to the porosity results, the action of the GH7 and GH5 enzymes was more restricted on the fibre surface. This may be due to the larger size of GH7 and GH5 enzymes compared to the GH45 enzymes. A CBM had a negligible or minor effect on the action of the GH45 enzyme: carbohydrate yield loss, pulp viscosity and molecular weight distribution were similar after treatment with the GH45 core and GH45 + CBM. However, some differences were also detected. The total pore volume of pulp treated with GH45 core was higher than total pore volume after the treatment with GH45 + CBM. The GH45 core was found to result in shorter fibre fragments and more fines compared to GH45 + CBM. In addition, with moderate enzyme dosage (0.25 mg/g) samples treated with GH45 core dissolved faster in CED compared to the pulp treated with GH45 + CBM. Hence, the presented results clearly show that among the studied enzymes the GH45 endoglucanases are the most potential enzymes for increasing fibre reactivity with low yield losses. The CBM domain was not critical for efficient enzyme action at high dry matter consistency which can make enzyme recycling more feasible due to lower enzyme affinity to cellulose. Open access funding provided by Technical Research Centre of Finland (VTT). Funding from the Academy of Finland (Decision No 277791) for the Porofibre consortium project is highly acknowledged. This work was a part of the Academy of Finland’s Flagship Programme under Projects Nos. 318890 and 318891 (Competence Center for Materials Bioeconomy, FinnCERES). Support from the Foundation for Aalto University Science and Technology and collaboration with the ACel research programme funded by Business Finland (former Finnish Funding Agency for Technology and Innovation, Tekes) as well as industrial partners is highly appreciated. Alexey Khakalo (Aalto University) and the ACel programme are acknowledged for the compositional data of the bleached softwood kraft pulp. Analytical expertise of Atte Mikkelson and technical assistance of Mariitta Svanberg, Liisa Änäkäinen and Ritva Heinonen is gratefully acknowledged.